A small blue-gray goose with a round body and white head, the emperor goose (Chen canagica) breeds primarily in western Alaska’s Yukon-Kuskokwim Delta, and parts of Russia flanking the Bering Strait. In winter, the majority of the population moves to the Aleutian Islands seeking ice-free beaches. A few rare individuals have been found along the Pacific Coast south to California. The population declined drastically in the 1970s and 80s. Little is known about the cause of the decline, but the population currently seems to be on the rise in Alaska. Nome: Regular though scarce at Safety Sound in late August or September. Wales: Small spring flocks of less than a dozen are sometimes seen passing by. Gambell, St Lawrence Island: Small groups are likely to show up at “The Point” in spring and in fall. 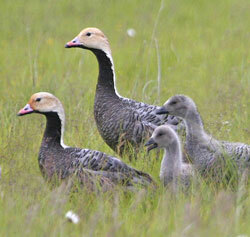 Kodiak Archipelago: About 300 of the geese winter here, starting to show up with wintering ducks in late September. Perhaps the best place to find them on the road system is along Chiniak Road at the head of Womens Bay where they begin arriving in October and by mid-November. They usually can be found along the shorelines through April and sometimes into early May. Bristol Bay: An important migratory stopover and pathway for waterfowl, including the emperor goose, from late March to early May. They may be seen around Dillingham or Cold Bay.